For the second year, the Tanja Liedtke Foundation’s inspiring dance workshops will be delivered to NAISDA Dance Academy students. After such a succesful 2012 series, the 2013 program will be expanded to invite several Indigneous independent artists from Sydney and Canberra. The 2013 workshops will occur at the end of August 2013 into September.Kristina Chan and Amelia McQueen will deliver these workshops. Following an initial workshop in May 2013, the Austalian Theatre for Young People (atyp) will host Kristina Chan and Craig Bary in September this year to work on a series of workshops with senior students. The group will consist of young artists who act, dance and tell stories through performance. They will be focussing on the physical and vocal aspects of contemporary theatre and dance theatre. 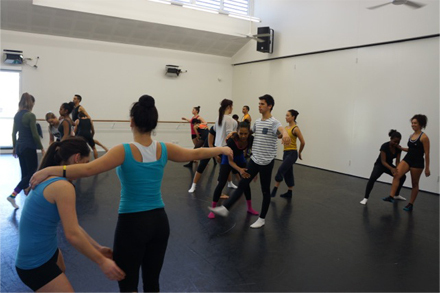 Later in August, the Tanja Liedtke Foundation will again be delivering the inspiring dance workshop program to students at NAISDA Dance Academy. Kristina Chan and Amelia McQueen will be in residence at NAISDA’s Kariong campus , working with all of the students that attend the academy as well as some independent professional dancers who will join the workshops in the second week. This program will lead students through a creative process where the young artists draw on specific starting points and develop their own original choreography. They gain skills in collaboration and structuring as they work with each other, while being guided by Kristina and Amelia. This workshop will be followed by a return of the inspiring dance workshops to the Australian Theatre for Young People (atyp) in Sydney. Following a first workshop with the Ensemble group in May, Kristina Chan and Craig Bary will work with some older students in September, in a week long course which will also incorporate voice workshops. On 27 May, a group of young performance artists who make up the Ensemble group of the Australian Theatre for Young People (atyp), worked with Kristina Chan and Joshua Tyler in a workshop based on creating movement from ideas and concepts that were part of the works Kristina and Josh collaborated on with Tanja. The young artists (who are used to working with text as well as devised work) responded so well to the tasks Kristina and Josh set them, and came up with some brilliant movement invention. TLF is looking forward to working with more young atyp artists this year. These workshops are supported by the Tanja Liedtke Endowment – Perpetual Foundation.